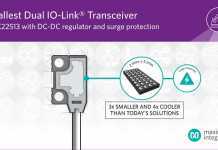 The LTC3875 is a feature-rich dual-output synchronous buck controller that meets the power density demands of modern high speed, high capacity data processing systems, telecom systems, industrial equipment and DC power distribution systems. The LTC3875 delivers high efficiency with reliable current mode control, ultralow DCR sensing and strong inte-grated drivers in a 6mm × 6mm 40-pin QFN. Multiple LTC3875s can be paralleled to provide higher current, or it can be combined with the LTC3874 to deliver the same performance with a smaller footprint. The LTC3874 is a small footprint (4mm × 5mm QFN), dual PolyPhase current mode syn-chronous step-down slave controller (phase extender). It is suitable for high current, multi-phase applications when paired with a companion master controller, such as LTC3875. 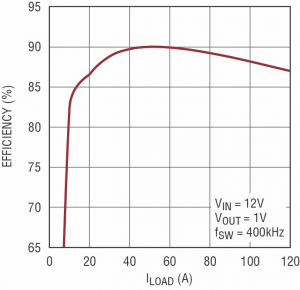 The LTC3874 can use sub-milliohm DC resistance power inductors to optimize efficiency. 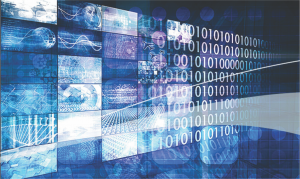 Imme-diate response to system faults guarantees reliability of the total solution. The LTC3875 can be easily configured as dual-phase, single-output operation for high cur-rent outputs. This design can be expanded with more converters and phases in parallel for even higher current. 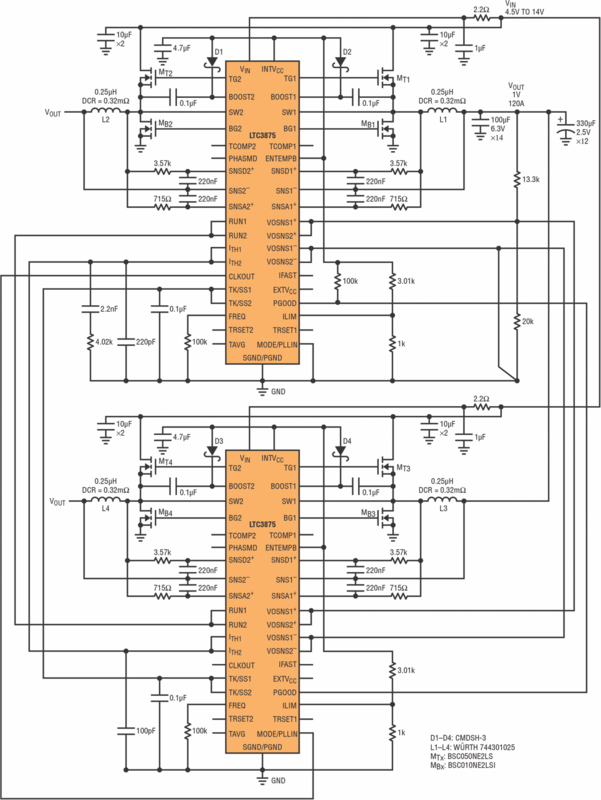 Figure 1 shows a 4.5V~14V input, single-output application schematic using two LTC3875s. The LTC3875s’ four channels run with 90° phase shift, reducing input RMS current ripple and required capacitor size. 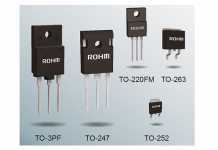 Each phase supports 30A of current with one top MOSFET and one bottom MOSFET. The LTC3875 employs a unique current sensing architecture to enhance its signal-to-noise ratio, enabling current mode control even with a small sense signal from a very low inductor DCR—1mΩ or less. As a result, efficiency is high and jitter is low. Current mode control yields fast cycle-by-cycle current limit, current sharing and easy feedback compensation. 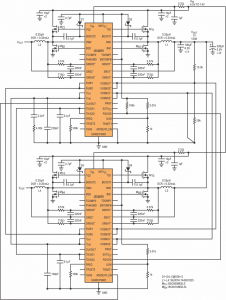 The LTC3875 can sense a DCR value as low as 0.2mΩ with careful PCB layout. 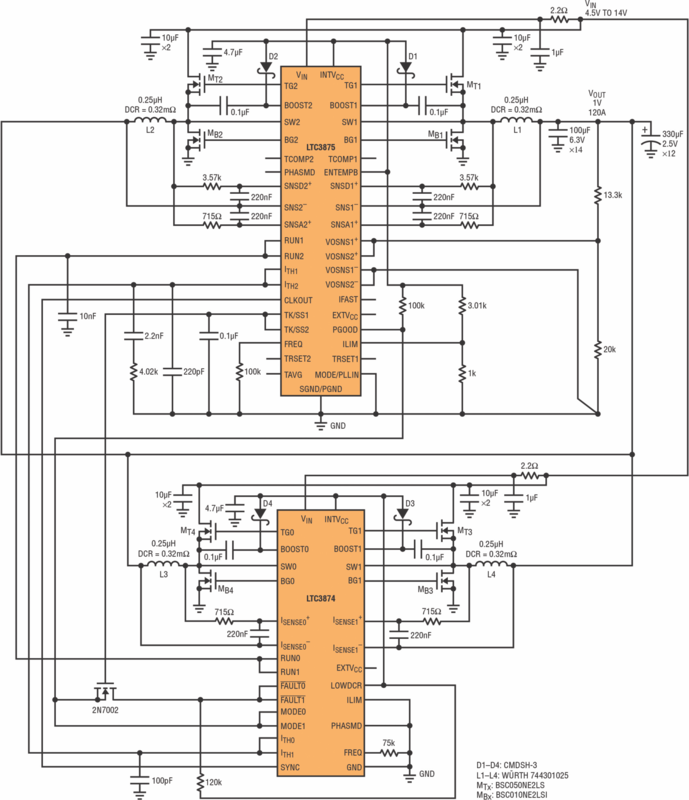 The LTC3875 uses two positive sense pins SNSD+ and SNSA+ to acquire signals. The filter time constant of the SNSD+ should match the L/DCR of the output inductor, while the filter at SNSA+ should have a bandwidth five times larger than that of SNSD+. Moreover, an addi-tional temperature compensation circuit can be used to guarantee the accurate current limit over a wide temperature range, and DCR variation. 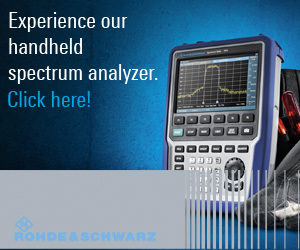 Efficiency can be optimized with an ultralow DCR inductor. 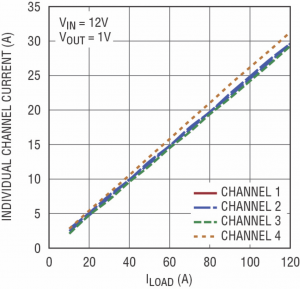 As shown in Figure 2, the total solution efficiency in forced continuous mode (CCM) is 87.1% at 12V input and 1.0V, 120A output. 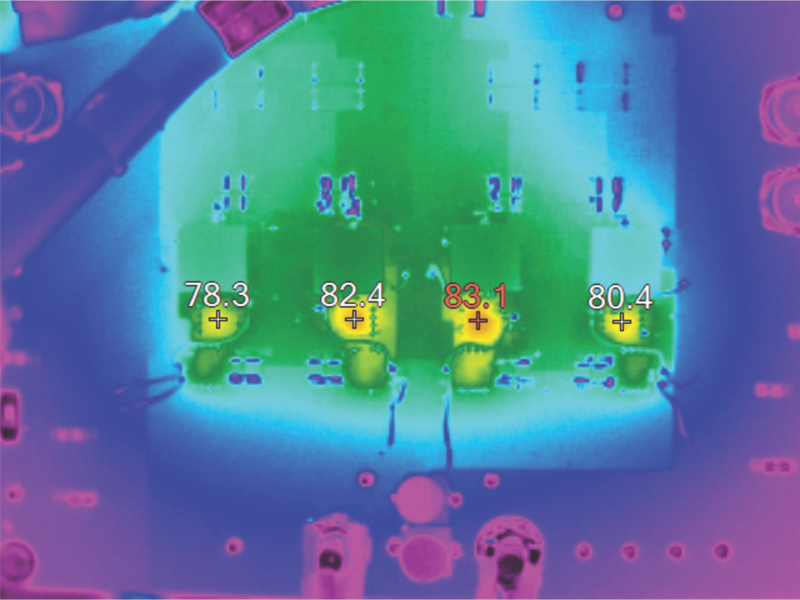 The hot spot (bottom MOSFET) temperature rise is 58.1°C with 200 LFM airflow as shown in Figure 3, where the ambient temperature is about 25°C. 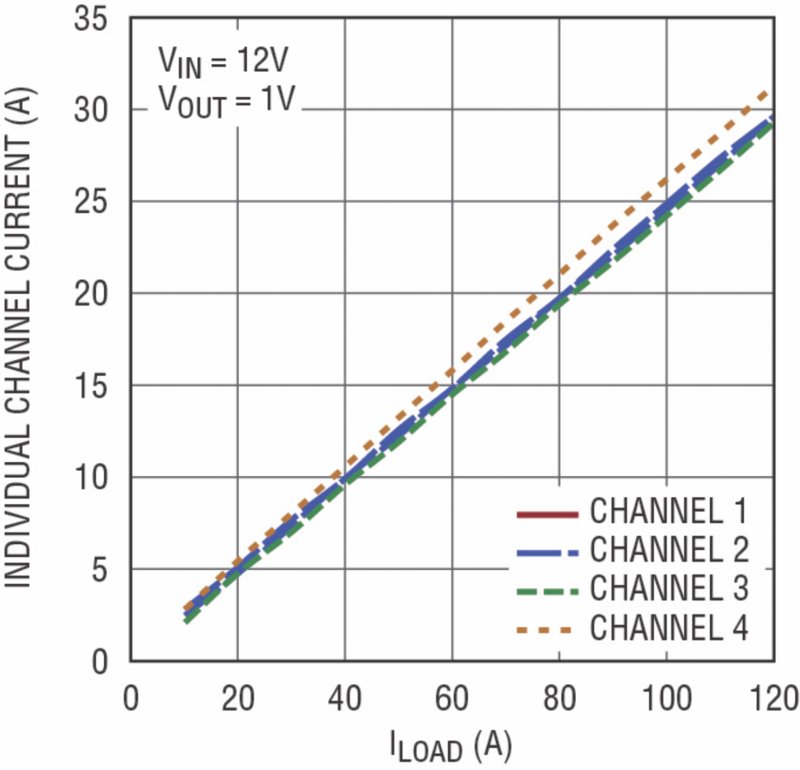 The DC current sharing among the four channels is shown in Figure 4. 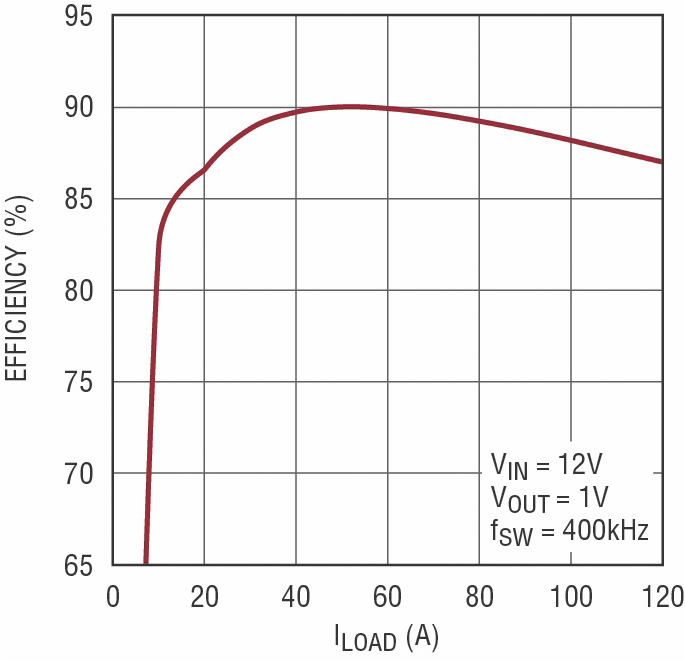 The difference at full load is about 2.0A (±3.5%) with a 0.32mΩ DCR inductor. Figure 5 shows an alternative to the 4.5V~14V input, single-output application shown in Figure 1—in this case using an LTC3875 and an LTC3874. The LTC3874 phase extender acts as a slave controller, but it supports all the programmable features as well as fault pro-tection. ITH pins of the LTC3875 and LTC3874 are connected for current sharing. The CLKOUT pin of the LTC3875 is connected to the SYNC pin of the LTC3874 to syn-chronize switching frequency. The MODE pin of the LTC3874 is connected to PGOOD, which allows DCM operation during start-up period for pre-bias load condition. The FAULT pin of the LTC3874 is pulled up to the INTVCC pin and is connected to the PGOOD pin of LTC3875 via a TK/SS pin voltage-controlled MOSFET. 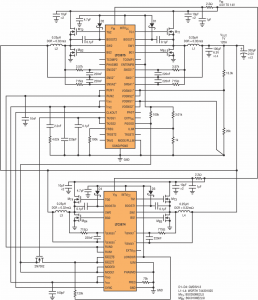 When the PGOOD pin is pulled low due to a fault, the LTC3874 can shut down both channels for protection purposes. Like the LTC3875, the LTC3874’s current mode control is accurate even with sense signals from an inductor DCR below 1mΩ. Compared to the master LTC3875, the LTC3874 simplifies pinout and uses only one set of RC components for DCR current sensing. The filter time constant of the RC filter should have a bandwidth five times larger than that of the L/DCR of the output inductor. 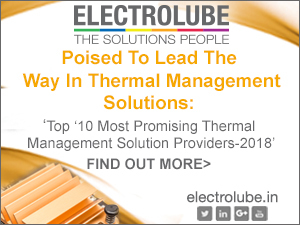 The total solution efficiency and thermal performance is similar to that of the two-LTC3875 solution. The DC current sharing among four channels is accurate. The difference at full load is about 1.6A with a 0.32mΩ DCR inductor. 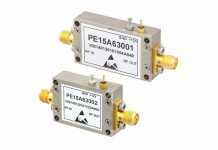 The LTC3875 delivers an outsized set of features for its small 6mm × 6mm 40-pin QFN. 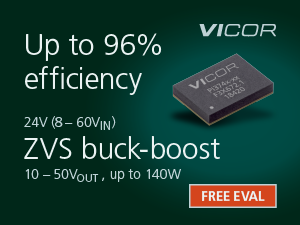 It of-fers high efficiency with reliable current mode control, ultralow DCR sensing and strong in-tegrated drivers. Tracking, multichip operation, and external sync capability fill out its menu of features. Furthermore, the slave controller LTC3874 offers a smaller footprint solution when paired with the LTC3875. The LTC3875 and LTC3874 are ideal for high current appli-cations, such as telecom and datacom systems, industrial and computer systems applica-tions.